"I think there should be laughs in everything. Sometimes, it's a slammed door, a pie in the face or just a recognition of our frailties." Welcome to my week in words. A slightly more productive week when it comes to blogging. I even have this post up on the day it should be! I'm glad to be back on track a little. Now I just have to make my weeks a little more interesting to read. This week's post covers from Sunday 10th to Saturday 6th of January. Enjoy! Sunday was highly uneventful. Just how I like em. It was Eva's last day off and the last day we could do nothing but binge watch Degrassi together. We got up for breakfast as usual and then cleaned out our snails. The only productive thing we did all day. Once we had that finished up we headed to bed to watch Degrassi the rest of the day, only getting up to get ourselves fed. Our aunt Karen was busy with school work so she didn't visit. We'd got so much Degrassi watched through out the week we ended up saying goodbye to the original cast and began meeting the newer ones. It's a little scary how many episodes we've made it through lately. It's probably not healthy. On Monday Eva got me up before she headed to work so we could have breakfast together. Good Mythical Morning was back after being on a break over the New Year, so we watched it while we ate. Once Eva left for work I chilled for a while before working on My Week In Words while watching ice hockey. Got to love a split screen. I took a break from writing to have dinner then continued, finishing up in time for Eva getting home. Eva finished work around 9pm so I had supper while she ate dinner and then we headed to bed to watch some Degrassi. Tuesday didn't get off to a great start. I hadn't slept well because Edwin was unsettled all night and we had a power cut in the morning. My mum hadn't felt well so she didn't have Luca. Luckily my ventilator has a battery so I stayed in bed until dad could come home from work and fix some of the electric. There was no point getting up beforehand as I wouldn't have been able to have breakfast. He wasn't sure what was causing it so he only put the electric on in my room, the living room and the kitchen. I watched Good Mythical Morning on my phone while I ate and it wasn't until I set up my laptop when I was finished that I remembered the electric in the hall was still off and therefore we had no Wifi. You can imagine the complete horror of realising that. Thankfully I had 4G on my iPhone or I may not have survived. I tend to get a headache if I watch things on my phone for too long so I decided to be productive to pass the time instead. 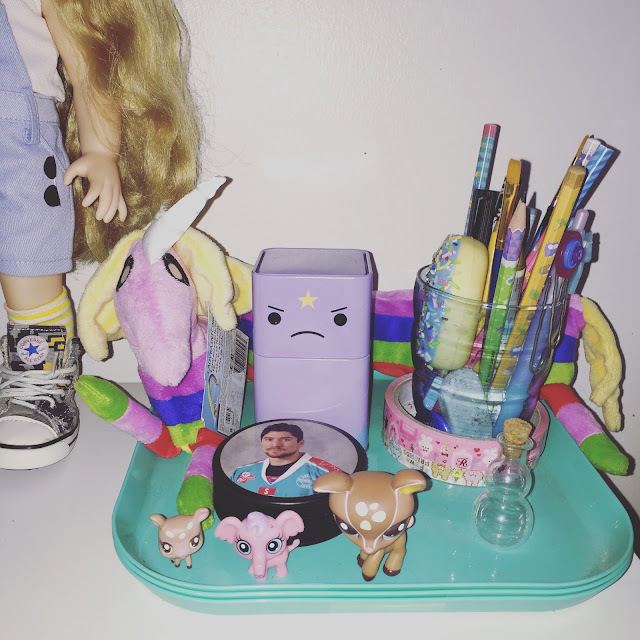 I finally set about putting away my Christmas decorations and then tidied my desk and changed some stuff around. I also put some of my Zelfs in my display case as I'd put them away a while ago. I'm thinking of getting rid of some of my least favourite ones. I feel bad because I spent so much money on them but I just don't have the space to display everything. Ah, the trials and tribulations of being a toy collector. Anyway, by the time I'd finished with my room my dad had just come home and fixed the rest of the electric and the internet. After dinner I worked on My Week In Words while catching up on more ice hockey. Later I had supper then headed to bed. The last of 2015's My Week In Words was posted on Tuesday also. You can check it out here if you missed it. I woke up early on Wednesday as I wasn't feeling well. I was up for a while but ended up heading back to bed when I felt better and slept until pretty late in the day. When I finally got up I had breakfast with Eva while watching Degrassi. Eva got us chocolate croissants the night before for breakfast and they were so good. Just writing about them makes me wish I had one right now. But I digress, Wednesday was another day full of Degrassi. I did shower at some point before continuing with more. Everybody was working on Thursday, so Mum got me up before she headed off. I watched Good Mythical Morning by myself as I ate then hid out in my room all day. I'm still a little nervous of the postman appearing. The day didn't start off very productive. I browsed online and YouTube. Dad came home at lunch time to get me a cup of tea etc. In the afternoon I got to work on a blog post. I was happy to be writing something that wasn't part of My Week In Words series. I'm sure everyone is bored of reading these posts by now. I'm glad to be getting back into the sing of things now and I hope I'll have some more interesting posts coming up from now on. I caught up on more NHL games while I wrote. Finally getting some use out of my GameCenter Live subscription. When Eva and my parents got home they brought in McDonalds for dinner. I didn't feel great, I've been off my food lately, so I didn't end up eating mine. Once Eva was finished her dinner we headed into bed to continue with Degrassi. I was on my own again on Friday once my mum left for work. She left a little later so I told my dad not to bother coming home to get my lunch. I watched Good Mythical Morning while I ate and then headed into my room to my laptop. As I had the day before, I browsed online and YouTube. I ended up coming across a YouTube channel that inspired a new series for my blog. I've written a post about it for this week coming so I won't spoil it. I ended up working on the first post of the series and it felt good getting something scheduled days in advance rather than the night before it's to be posted as has been the case lately. 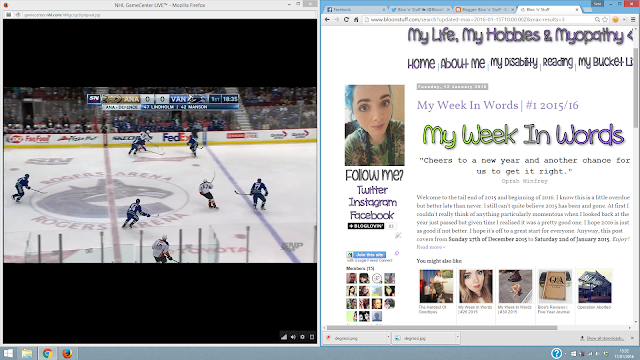 Once I had that post scheduled I settled down to watch ice hockey again while I caught up on My Week In Words series. 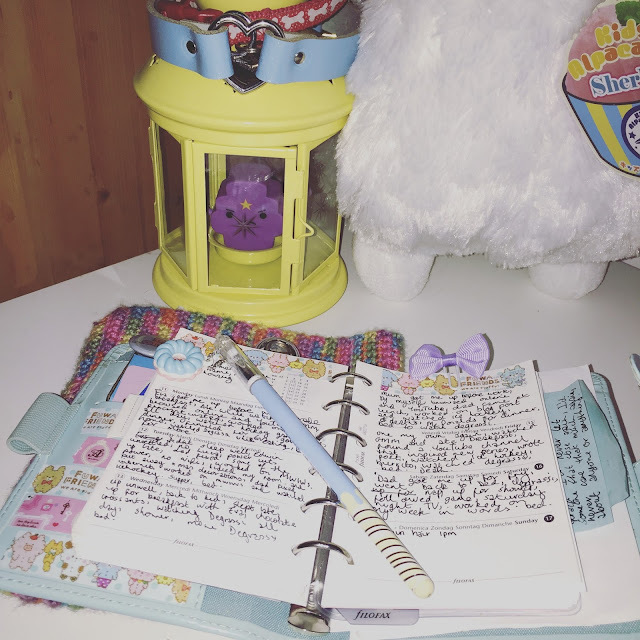 I was able to schedule my second post of the day when I finished off that edition of My Week In Words. To say I felt accomplished would be an understatement. Just before Eva got home I put an order in for some burritos. I think I wrote before about the new Mexican takeaway that opened in our town and I had my first burrito. Eva and I went to order from it again before Christmas and found it was closed. Eva then heard the owner had been burgled at gun point and they'd closed for a while. I think he actually sold the place. It opened again in the new year and I was happy to be able to order again. The only complaint I have is that it took over two hours to arrive. When it finally arrived Eva and I ate while we watched Degrassi. Our dad wasn't in a great mood so once we finished eating we headed to bed to watch more. On Friday I posted the first Midweek Misc post of the year about the series I've been watching lately. You can check it out here. Dad didn't have golf on Saturday because of the weather so I was up a little earlier than usual for my fry up. After eating Eva and I went back to bed to watch Degrassi. We were pretty tired after staying up late the night before. Binge watching is exhausting. My mum had to go into work for a couple of hours because she'd been late in on Friday. I stayed in bed all day watching Degrassi and ended up having a nap. I was still in bed when my parents got home as my dad had been called into work too. While in work mum found this bargain. A birthday cake reduced to 75p! 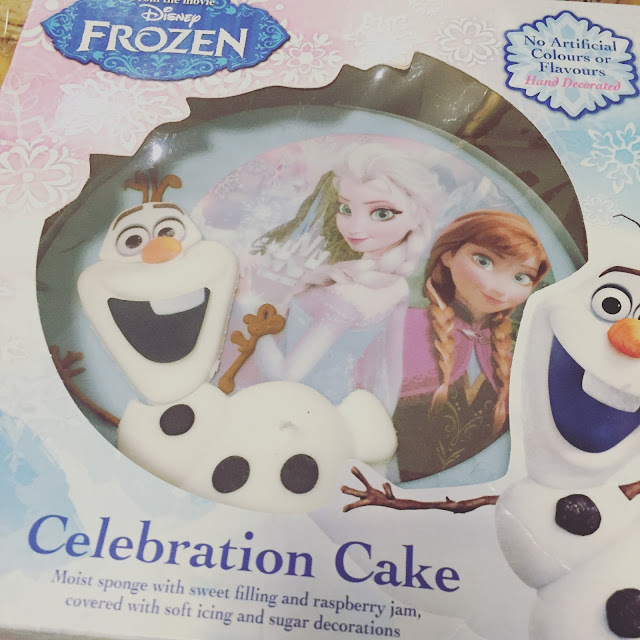 It seemed awesome until Eva said that if mum hadn't bought it that perhaps a poor family could have got it for a child's birthday. Eva got out of bed before me as she needed a shower before going out with her friend. Once Eva was out of the shower I text the house phone to ask could I get a shower. I thought it was hilarious. Have you ever text a house phone? My dad wasn't as amused. Still, I got my shower and then followed an awful Belfast Giants game on Twitter while I watched some Saturday night television. I had planned to be super productive and get this post finished but I ended up watching Take Me Out and then The Jonathan Ross show. I particularly enjoyed Jonathan Ross' interviews with Michael Caine and Sylvester Stallone. Both were hilarious and so down to earth. After that I did a little work on My Week In Words but ended up getting distracted updating my Goodreads and my Goodreads Challenge for 2016. Turned out I read 96 books in 2015! My challenge had been set at 50. This year I've made my challenge 85 books. 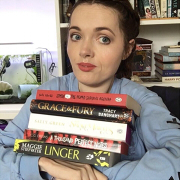 You can check out what books I've been reading and how I'm getting on with my challenge here. It felt a little odd going to bed and reading instead of watching Degrassi but I hadn't realised how much I missed it. While I was reading I got a phone call from Eva. She was at a bar, paying for drinks, and couldn't remember her pin number. Why she thought I would know it, I don't know. The moral of the story is, you should probably stop drinking before you can't remember your debit card pin. After reading for a while longer I finally nodded off to sleep and that was my week in words. Tell me something you did this week!